Education has an extraordinarily important role to play in efforts to eliminate poverty world-wide. This book reveals the nature and complexity of these relationships and provides indispensible pointers to the kinds and extent of policy changes that are required. provides the field of educational research with a contemporary economic and socio-cultural reassessment of educational outcomes in relation to poverty. 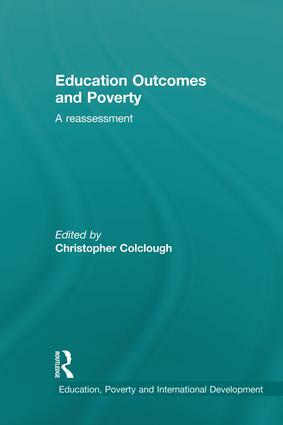 identifies the key theoretical and methodological challenges involved in researching the outcomes of education for the poor. This book will appeal to undergraduate and postgraduate students and researchers in the fields of international and comparative education, education policy, development studies, African and Asian studies and related disciplines, and to those working on education policy at national or international levels in governments and international institutions. Christopher Colclough, Commonwealth Professor of Education and Development and Director, Centre for Education and International Development, University of Cambridge, UK. This series of research-based monographs and edited collections provides new analyses of the relationships between education, poverty and international development. The series offers important theoretical and methodological frameworks for the study of developing-country education systems, in the context of national cultures and ambitious global agendas. It aims to identify the key policy challenges associated with addressing social inequalities, uneven social and economic development and the opportunities to promote democratic and effective educational change. The series brings together researchers from the fields of anthropology, economics, development studies, educational studies, politics international relations and sociology. It represents a unique opportunity to publish work by some of the most distinguished writers in the fields of education and development along with that of new authors working on important empirical projects. The series contributes important insights on the linkages between education and society based on inter-disciplinary, international and national studies. Sharp, critical and innovative studies are sought that are likely to have a strategic influence upon the thinking of academics and policy-makers. They may include critical syntheses of existing research and policy, innovative research methodologies, and in-depth evaluations of major policy developments. Some studies will address topics relevant to poverty alleviation, national and international policy-making and aid, whilst others may represent anthropological or sociological investigations on how education works or does not work within local communities, for households living in poverty or for particular socially marginalised groups. Preference will be given to studies with a comparative international approach although some single-country studies will be considered, where they raise interesting theoretical and policy issues with clear relevance for international audiences.